So the year 2016 is past, the year 2017 has begun. The world, our country has been afflicted by violence whether by state sponsored or terrorist sponsored attacks. Many times the violence has been random. The call of “Peace on Earth; Goodwill to all!” seems to ring hollow during this holiday season. While engaged in Morning Prayer, I came across this verse from Psalm 42 “Why are you downcast my soul; why do you groan within me? Wait for God, whom I shall praise again, my savior and my God.” This will be verse I think will become my new mantra for this coming year. On New Year’s Eve, I joined my wife at a worshipping community she goes to; and participated in a Burning Bowl ceremony. We were invited to write down on a slip of flash paper, something negative we wanted God’s help in taking away from us. We then placed the slips in a bowl that had a small fire; which consumed the petitions. It was very moving. The year of 2016 has been a year of some changes for me personally. I finally found employment at a South Shore company; starting in January, 2016. So I will be entering my second year of employment, and it has been good. The commute is long, two hours to and back; using commuter train and subway. I am always telling people that at least someone else is doing the driving. In September of this year, I will be entering my fifth year as an ordained Deacon in the Roman Catholic Church. I cannot believe that much time has passed. I have been assigned to three Beverly, MA, parishes; where most of my work has been liturgical, assisting at 5 of Masses celebrated in two of three parishes. It seems a lot; but I have experienced spiritual aid, that helps me perform my sacred duties well. The Deacon has several ways of service he offers to the Church; a service of Worship, service of the Word, and a service of Charity. I am still reflecting and discerning what that means in my daily life. What role should daily prayer, daily reading, and meditating of Scripture should have. I am not where I think I should be. Maybe, this New Year, I will find some guidance; and perhaps some improvement. A New Year begins, a year of fear, a year of anxiety, but also a year of hope, a year of change, and a year of trust in the Lord. Over a cup of coffee, I would be telling you about my wife and I attending the 2016 Annual Convocation of Deacons of the Archdiocese of Boston, at the Pastoral Center, in Braintree, MA, yesterday. There was a very good turnout of deacons, spouses, and men who are in formation for the diaconate. After some coffee and pastries; the Morning Prayer, we heard a presentation from Deacon Stephen Lape from the Diocese of Albany, NY. Deacon Lape is also a Licensed Social Worker, and his topic was on Addiction, the types, the addictive substances, and the treatments. The talk was timely for us, since the Boston area has been going through an opiod addiction crisis. Some of my brother deacons have been trying to help persons suffering from addiction, and/or their families, through this illness. After the presentation, we received a report from two of our brother deacons on the results of a survey that was sent out to the Boston Diaconate community on the New Evangelization. “The New Evangelization “is a term coined by the late Pope St. John Paul II. The goal in the Archdiocese of Boston is to reach out to those Catholics who may have fallen away from the Church, and invite them back; and to reach out to others who may not be Christians. This is to be done by having all Catholics realize that we are all called by Christ to become evangelizers; by our words and lives, to show that the Good News of Jesus Christ, still has the power move people’s hearts, and make a difference in their lives. The goal of the survey was to provide a snapshot for our Cardinal Archbishop, of the work of the diaconate in the Archdiocese, and how it furthers the goals of the New Evangelization. The survey shows that, as of 10/15/16, there are 166 active Deacons in the Archdiocese. That a majority of us provide from 5-10 to 10-30 hours of weekly service. That 52% of us preach on a monthly basis; a majority of us prepare couples to receive the sacrament of marriage; prepare new parents for their child’s baptism, and preside over the celebration of the sacrament; and a majority of us preside over wake services. 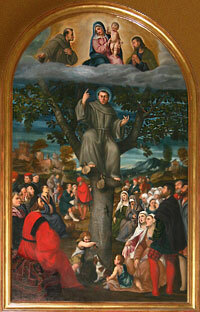 The survey also showed a multitude of other social, charitable, and parochial works we are involved in. There followed small group discussions on how we can further the work of New Evangelization. After a celebration of the Eucharist, followed by lunch; we heard a moving talk by Mother Olga of the Sacred Heart. She is the foundress of an archdiocesan religious community of sisters, “Daughters of Mary of Nazareth” She is a favorite speaker of the Boston Diaconate community, and she did not disappoint. 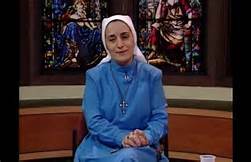 She is an Iraqi Eastern Rite Catholic nun, who came to this country, in 2001, to finish her education. She became involved in campus ministry at Boston University. In 2005, she was received into the Roman Catholic Church, and in 2011, she received permission from Cardinal Sean O’Malley to establish the new religious community. Mother Olga spoke to us about the need for prayer in our ministries, the need for humility, and the need for faith. I hope to have more reflections in future posts. 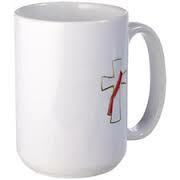 Over a cup of coffee, I would share with you the today’s news that Pope Francis has named 17 individuals to the “scarlet;” cardinals in the Catholic Church. 13 of them are young enough to be electors in future papal conclaves. Three of them are Americans; Archbishop Cupich of Chicago, Archbishop Tobin CSSR, of Indianapolis, and Bishop Farrell, formerly of Dallas, now Prefect for the newly formed Dicastery for Laity, Family, and Life. With these current and past appointments, Pope Francis is well on his way to leaving his imprint on the Catholic Church, well into the future. 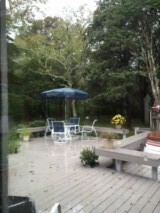 Over a near empty cup of coffee, I would tell you that my wife and I are now visiting her parents and one of her brothers on Cape Cod; and that it is raining cats and dogs, and the wind is blowing very strongly right now. Ah well. Well, the cup is empty, and I am now nursing a glass of beer. I hope to see you next weekend, over a cup of coffee.